The ability to tie a show uses several different skills. Children must be able to use their fine motor skills to tie the knot, use the appropriate tension to tighten the laces so the shoe won’t fall off, and do all the steps in the correct order. The best way to learn how to do this is by practicing. 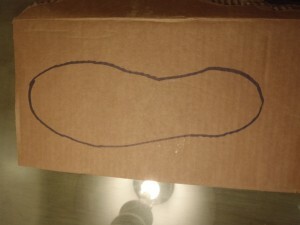 With this activity, children can both color their own shoe and learn how to tie their shoes. As children are coloring their shoes and working on tying them, make sure to go and interact with them. Asking questions gets children’s minds thinking and actively engaging in the activity. -Markers, crayons, or colored pencils. 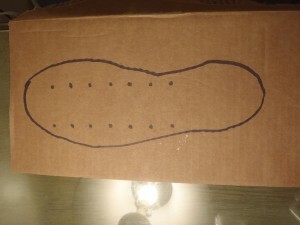 Trace Shoe Template on a piece of cardboard. Poke holes in the specified places large enough to place string through. Label Top, Bottom, Left, and Right on cardboard outside of the shoe. Begin by coloring the shoe any way you wish. Put string through the top two holes. 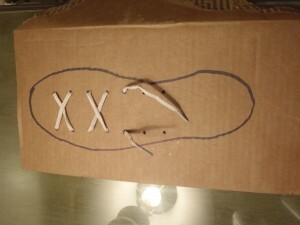 Alternate bulling the laces through the holes on the opposite sides, making an X as they cross in the middle. Make sure the lace from the left side goes into the next hole on the right side. Continue to lace up the shoes while pulling tight at each step. Continue lacing until all the holes are used. Give directions using left and right to explain how to lace the shoe. Work on tying the bow. Cross the loos end of the laces making a “X”. Pull them tight so the X is right at the bottom of the laces. Pinch the end of one of the laces between thumb and index finger to make a loop. Do the same to the other lace. Cross the two loops to form an X.
Tuck one loop underneath the other going from the BOTTON to the TOP. Pull the loops tight to create your bow! Should we tie the shoes tight or loose? What would happen if we didn’t tie our shoes? What happens if we tie the shoe too loose? What happens if we tie the shoe too tight? Why do you think the laces need to cross over each other?